The core roles of the board of directors suggest that a discussion of change in nonprofit organizations is incomplete without an explanation of the influence, role, and impact of the board of directors in nonprofit change. This chapter provides a brief overview of the types of nonprofit board of directors followed by an overview of the challenges and opportunities that are related to change in the sector. The chapter also explores the responsibilities of the board of directors in change. This will include how the board can help to guide the vision for change in the organization. The board of directors has a pivotal role in the change process in nonprofit organization. 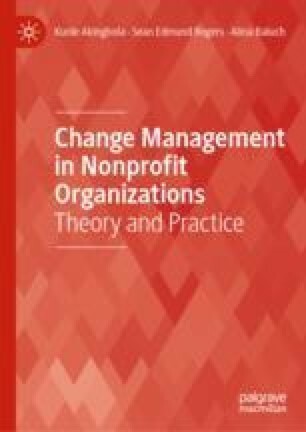 From the first step of determining the need for change to the final phase of institutionalizing the change, the governance and strategic leadership roles of the board are critical to help the nonprofit organization to adapt and manage change. The chapter provides an overview of the roles of the board of directors in relation to change. The examples of the challenges and opportunities of change for the board emphasize that change can affect not only the role of the board, but also the characteristics and the competencies they use in governance and strategic leadership. Moreover, the examples of change challenges and opportunities reinforce the need for the board of directors to understand the relationship between the environment and the organization as the basis of their governance and strategic leadership roles. The Bayview Foundation Inc. (2018). http://www.bayviewfoundation.org/.